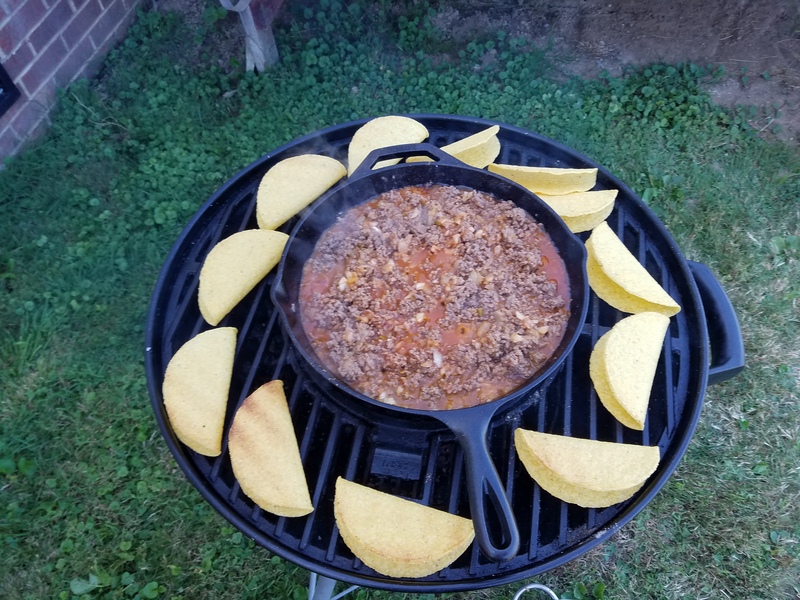 My buddy Brad grilled tacos on his Weber kettle grill about a week and a half ago. The pictures made me pretty hungry, and I knew I had to try it. Tacos might be Dana’s favorite food, which is a plus. I love feeding people, so having the chance to throw something on the grill (as outdoor cookin’ is something I seem to have an affinity for) that is a favorite food of somebody I love is a plus. 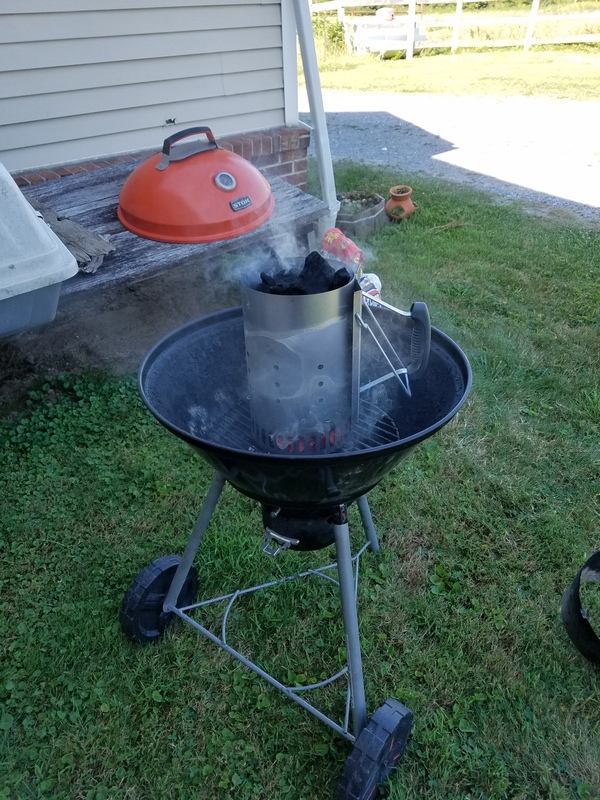 I can’t say it enough: I love my charcoal chimney starter. 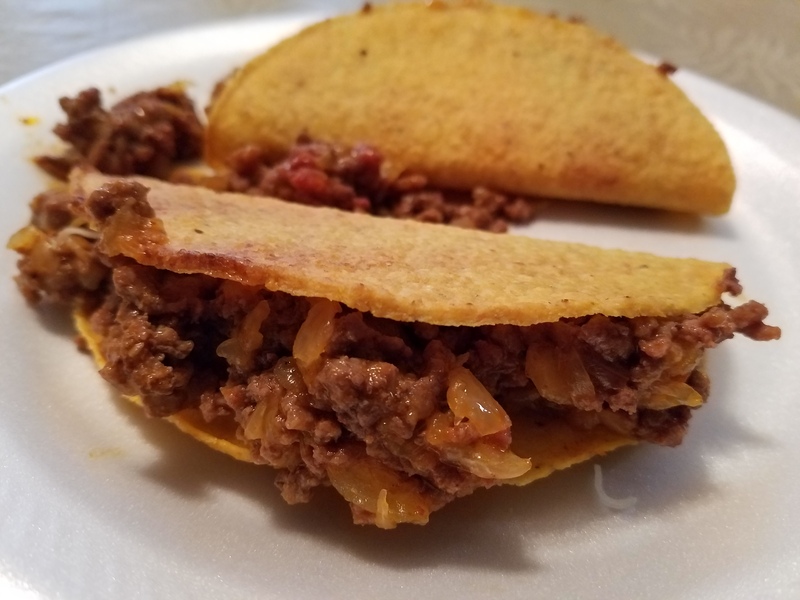 Those taco shells tasted wonderful after taking on the grilled flavor. My lighting with food pictures needs work, but it was more beautiful than this. Old El Paso is a highly used seasoning. Whenever I smell it, it has a blast of cumin, a scent that is well used in the southwestern region of the United States. My girlfriend and I wasted a Chili’s gift card earlier this year; I should have ordered the “Big Mouth Bites” (sliders), but I got some southwestern brisket bowl, which was plain putrid. I say that, because it tasted like all they did was throw a smidgen of an avocado, some onions and other vegetables in there and drenched it in Old El Paso seasoning… hence why I say it’s a highly used seasoning! Anyway, that’s what I used on my ground beef yesterday when I browned it on my STOK drum grill. After draining the majority of the fat, I added a whole big onion diced fine. I added two packets of Old El Paso sauce as well as a tiny jar of medium Taco Bell sauce I had in the closet. This was my mistake. It wasn’t a mistake to mix the sauces; it was a mistake because I didn’t use enough sauce. I didn’t have enough sauce on hand to make saucy tacos. I typically use Pace picante sauce. I love that stuff and it’s a favorite in my household, but I didn’t have on hand. The tacos were delicious in spite of what I wrote in the above paragraph, but they could have been better, which is why I say that I’m definitely going to try this again in the future but with a big, whole jar of Pace picante sauce. Happy grillin’. Have you ever cooked tacos on the grill? What was your method? Comment below! Troy, never have cooked them on the grill but am up for the experience. I think we’ll give it a go and report back on how they fare. We have made pizza on the grill and that was an excellent change of pace from taking it out of a box!